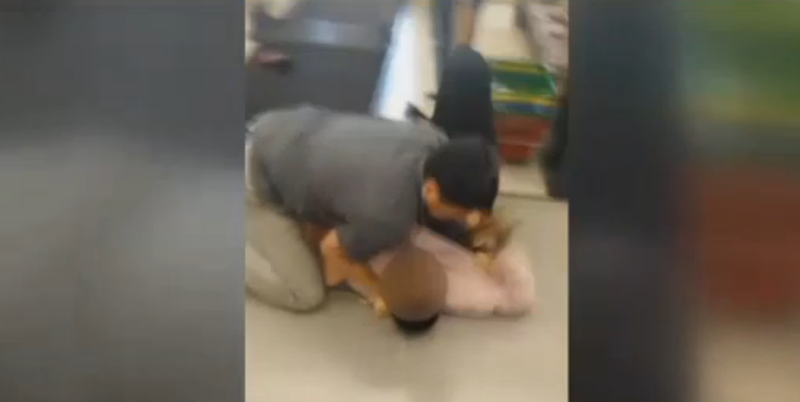 A community is outraged about cellphone footage going viral on social media that shows a Charlotte, N.C., beauty supply store owner constraining a black woman in a choke hold after accusing her of stealing. Community leaders and customers are now calling for a boycott of the store. Lim is seen getting in the woman’s face as the woman tries to ward him off. Lim then kicks the woman in her legs, yelling, “You hit me,” before dragging her to the crowd and placing her in a choke hold. Community leaders and customers say that regardless of the situation, Lim should not have attacked the woman as he did. Lim, the news station says, was trying to keep the woman at the store until the police arrived, but he has since apologized for his actions. “I don’t know; it just happened. I went crazy,” Lim said. “No matter what the reason, I feel very sorry to her and to them. Lim also filed a police report for a strong-arm robbery in which he noted that the incident took place on Thursday. So far, no arrests have been made. Corine Mack of the Charlotte-Mecklenburg chapter of the NAACP demanded that Lim apologize to the black community in Charlotte. “He took it upon himself to treat her in a way that no woman should be treated—in fact, no person should be treated,” Mack said. “That’s why I’m so disgusted and hurt. “Guess what? We are the ones who go to his store on a regular basis, and allow his family to live a good quality of life,” she added.